Milko Tester is a device which electronically determines the Fat % rapidly in milk. 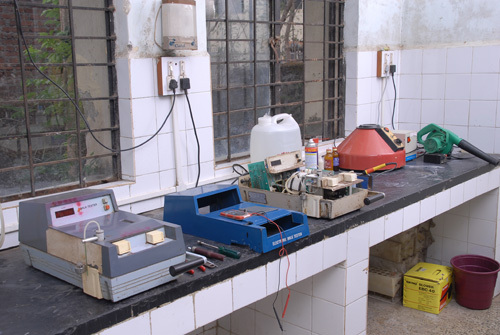 Milko Testers, Auto SNF Indicators & Milk Analyzers are used at primary Dairy Cooperative Societies (DCSs) in villages. The milk supplied by producer is tested before acceptance and payment is made on the basis of milk quality. This helps to good quality milk at primary dairy cooperative as well as at Union level. The transparent process results in strengthening faith of milk producer on Village Society and Union. Our Union provides Milko Testers, Auto SNF Indicators & Milk Analyzers to the DCSs on subsidized rate. Also we provide required Chemical, Sachet powder & Cleaning solution on subsidized rate. During the year 2017-18, we have distributed 187 Eco Pro Machines , 218 Eco Ultra Analyzer, 10 Indiz Machines, 50 Akashganga milk analyzers to DCSs. We have 19 centers with a fleet of 39 qualified technicians for repair of Milko Testers, Auto SNF Indicators & Milk Analyzers, in various places of the district, through which we provide services to the DCSs. We bear expenditure on spare parts above Rs.1500/- for Milko tester & Auto SNF machine and above Rs.7500/- for Milk Analyzer. Our Union has started ‘Risk Fund’ scheme for milk testing machines. For this purpose, DCSs have to contribute an amount of Rs.3000/- per Milko Tester/Auto SNF m/c., and Rs.7500/- for Milk Analyzer. Due to short circuit If any machine got damaged, we provide new machine from this scheme to DCSs.